I’m in New York, loving it, and loving the photos my knitting pal Rebecca took of Venezia. Here I am with Venezia at the Metropolitan Museum of Art, on a beautiful clear day. And a fun hi and hello to all the great knitters I met at the New York Yarn Harlot book launch! I don’t take my top off for just anyone, you know. 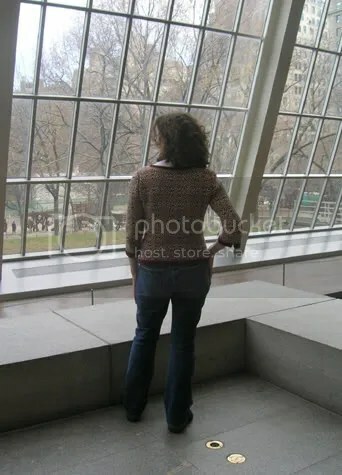 Just people who appreciate steeks. (I had a t-shirt on underneath, tsk, get yer minds out of the gutter). Yarn: Knit Picks Palette. Foreground (light): Cream, tan, twig, golden heather. Background (dark): Garnet heather (also for the hems), autumn heather, merlot heather, iris heather, clematis heather. Needles: 3.0mm (colour work) and 2.75mm (for hems and neckline). Modifications: When I looked on Ravelry I saw others had done a v-neck version, I knew I had to follow the lead on this one. I much prefer the versatility of v-necks and it’s a very practical style. Thank you very much to Maud’s modification notes, which I used as a guideline. I placed the beginning of the v-neck about an inch below the beginning of the armhole decreases. I also modified for length, adding 1 inch evenly before the waist shaping decreases (I did this by starting the chart sooner than the pattern instructions), and 1 inch even after the shaping decreases. I did similar modifications to the sleeves in order to add an inch in length there. These paid off big time – the waist sits where my waist is and I couldn’t be happier! I’m very pleased with this sweater – it fits, it’s comfortable, and damn is it pretty! It’s sort of surreal to actually wear it and think that I made it from balls of yarn. On the 2nd day I wore it I had to sort of stop in front of mirrors and look at it and think, WHOA. I made this sweater! Yo, for serious. If you’re thinking about making one of these, go for it. I won’t say it’s easy, I won’t say it’s hard. But I will say that it’s worth it. When I’d cut the steeks and sewn up the seams on the sleeves, I slipped it on unblocked to make sure it fit OK and to reassure myself. And it was reassuring to know that it did indeed fit just like I wanted. But at the same time it was an odd moment, because I realized that it was no longer my knitting. It had become a piece of clothing, and that meant I didn’t get to knit it anymore. And that made me kind of sad. The bar’s been set, my friends. More fair isle, more. Love it. Wanted to make some comment about how it makes you look fat– but I can’t becasue it looks fab! And I’m youre best fan now, since I commented first. Ohh, and I’m second too. Martha, eat your heart out. I totally had my mind in the gutter. I’m just sayin’. OH – I love it. I really love your neckline (didn’t like the orig. high neck in IK), and like your colour choice, esp. that dark brown. Looks fab. Loved that pic of you at the airport with TYH, too! Sounds like you had fun…can’t wait to read about it. Gorgeous – it looks great with a v-neck! The only thing that could possibly improve the Temple of Dendor is a sweater such as yours. Gorgeous! Oh Glenna – it is everything that I imagined and more. Well done! You got Harloted dude, way to go! And Venezia too. 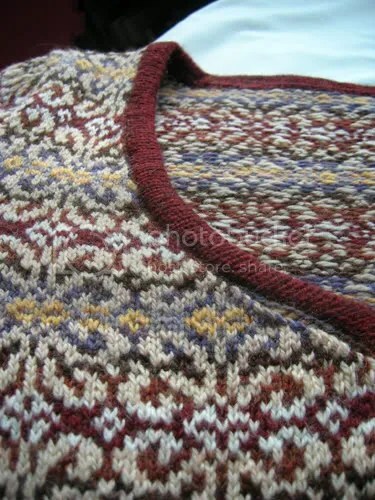 This is beautiful — it has been fun watching your progress on this sweater! I saw you on the YH’s blog!! V looks fantastic!! Glad you are smiling and happy!!! Giving a star performance on the YH’s blog AND wearing the delicious Venezia? Respect. It’s fantastic – well done! OMG, that is beautiful!!!! I’m glad it turned out perfectly! It looks fab. I hope you had a good time in NY! That’s simply stunning. Way to go! LOVE IT! Well worth the work! It’s so gorgeous! 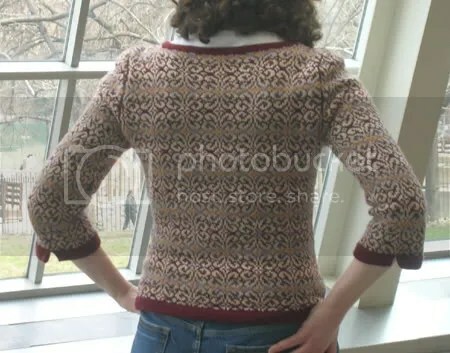 I’m not usually into patterned sweaters, but yours is soooo pretty I’m tempted to put it in my queue. Behind Basic Black. And the Brennan Cardigan. Man, I am a sweater slacker. Looks wonderful! I like your color choices. Just gorgeous! I love the dark red. 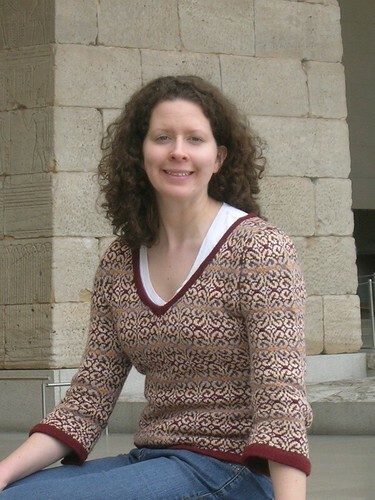 Congrats on finishing the sweater, your diss., AND showing up on the Yarn Harlot’s blog. Way to go Glenna! The stars are in alignment… thesis done…. photo op with the Yarn Harlot… finished sweater…..! Enjoy your visit in NY! Wow. Just wow. It’s amazing. The v-neck makes all the difference. Should I *ever* pluck up the courage to make this, I’ll need to copy your v-neck. That sweater really is fab! Congrats on finishing such a beautiful project. I’m so jealous! I wish I made the book launch!! Venezia came out amazing!! It looks great on you! wow. that came out truly incredible. i’m with you – it’s unbelievable you made something that intricate from sticks and string! colorwork always amazes me! 35 comments dude? At my best I get 6. Oh wow. It’s so pretty! Congratulations! I am in awe of your mad knitting skillz. What a pretty sweater! I am totally lusting after it. Well, after one of my own making. Which isn’t going to happen soon, so I will admire yours. Well done! I didn’t fancy myself a fair isle sweater wearer until now. Glenna, she’s absolutely stunning!! And what a great FO photoshoot, by the way…. Congrats! Kudos! Venezia is stunning and you look fabulous wearing it. What an accomplishment. I’m in awe. I saw this blog entry a couple of days ago — the sweater fits you beautifully, and the sleeves make it “updated” — I hope you got nice comments “in the flesh”. Very very nice. We all can certainly appreciate the design and knitting work!! Oh god! I was in front of you online at the Yarn Harlot in NYC and I could not stop staring at your sweater. It is AMAZING! I wanted to say something then but I thought that might be weird. Then I’m looking through some old knitty issues and there you were and I put two and two togther. Anyway, love love love the sweater. I’m always right up to date with my blog reading. LOL. Your Venezia is amazing! Making it a V-neck and adding to the length…very brave!